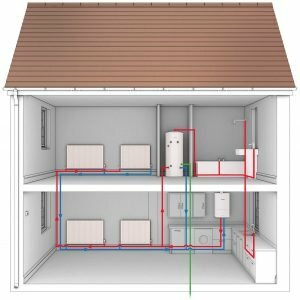 Firstly, many of the major individual components of the heating and hot water system are built into a system boiler, pump, control valves, pressure vessel, which means that installation is quicker, neater, easier and more efficient. Secondly, the system boiler removes the need for a feed and expansion cistern which would normally be located in the loft. High pressure hot and cold water at all outlets. Additional storage space. No water tanks in the loft and no hot water cylinder in the airing cupboard. Hot water backup if the unvented cylinder is fitted with an immersion heater. Good for multi bathroom/shower room installation. No need for additional shower pumps to boost water pressure. They require a certain amount of water pressure and volume to work correctly. The water within the radiator system will be higher than a traditional system.